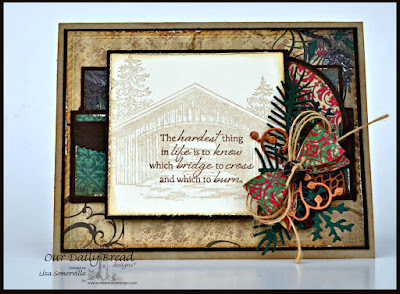 Designs by Lisa Somerville: Our Daily Bread Designs December Release and Blog Hop! 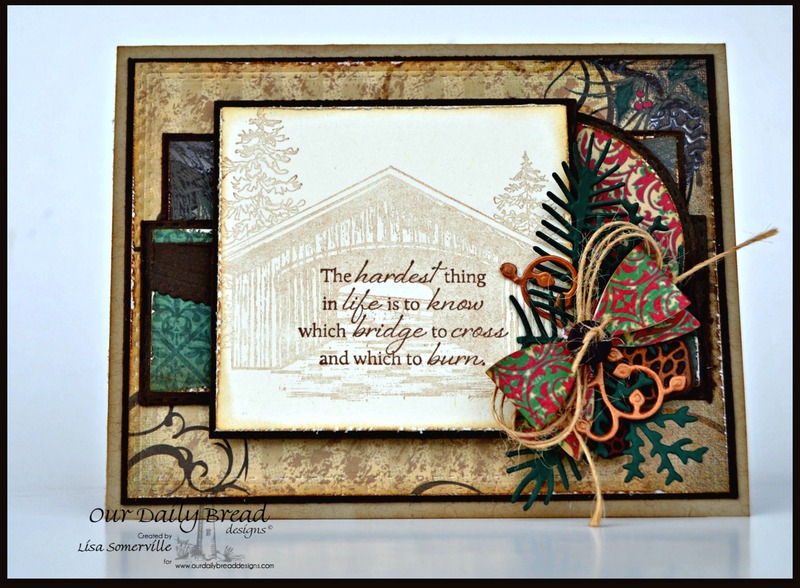 Our Daily Bread Designs December Release and Blog Hop! Welcome to the New Release post and Blog Hop showcasing projects from Our Daily Bread Designs December Release! You can see all of the December Releases here. Continue reading below to find out how you can win one of three $25 Gift Certificates to the ODBD Store good towards the purchase of ODBD stamps. Today, I'm sharing two cards using the Safe Travels stamp set, Rectangles, Double Stitched Rectangles and Double Stitched Circles Die sets from the December Release, along with a few previously released ODBD Custom Dies and the ODBD Vintage Ephemera Paper Collection and Christmas 2013 Paper Collection. (see supply list below). The image is stamped in Black Archival, then colored with Watercolor Pencils and die cut. I used the Double Stitched Rectangles die set to "emboss" the larger pattern paper panel. 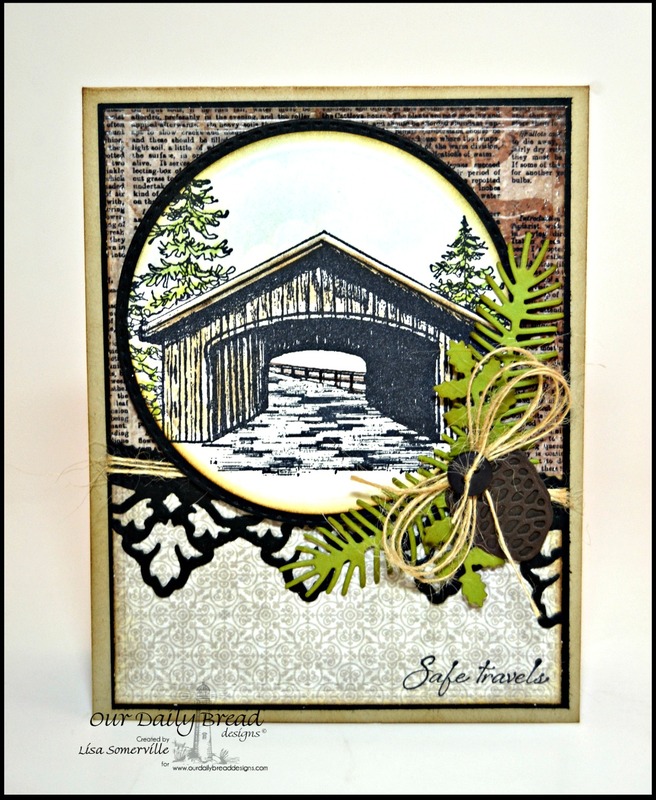 For this next card, I wanted the sentiment to stand out over the Covered Bridge, so I inked the image and stamped off, then added the sentiment using a SAMJ. I also used the Double Stitched Rectangles die set to "emboss" the larger pattern paper panel. Beautiful card, Lisa.. New technique for me to try. Love that! Thanks for your inspiration! Both of these are lovely Lisa! Beautiful cards. I am loving the new stamps and seeing all the pretty cards made with them today. Love the Covered Bridge in the background with the verse forward. My brothers live close to an area that has covered bridges. So lovely. Another pair of awesome cards with the new release. I love the idea of stamping off the covered bridge into the background. Beautiful cards! I love how you stamped the sentiment over the covered bridge..very creative! Lovely cards! I love the pretty elements you added to each! Great cards--love the covered bridge image. gorgeous cards! I love to create different versions myself! I love these vintage inspired cards. That stamp is so pretty! Very inspiring. Beautiful color and detail. Love them both. Beautiful creations. They really are splendiferous. Love the watercoloring. Both of your creations are beautiful, Lisa!! I love the overstamping of the sentiment on the image on the second, the vintage flair, and the added foliage on the first! Beautiful!! WOWZA! Beautiful! And the sentiments are terrific! Beautiful cards!! Love the color palette you have chosen!! Both cards have your signature creative style! Absolutely beautiful! Your one covered bridge card makes me feel like I am really looking through to the other side. Great samples, Lis! I love the sentiment over the image on the second! 2 great cards with that covered bridge stamp....love how you did the verse one! neat use of the partial stamp, and shown colored or not, great embellishing too! Love your cards Lisa. Thanks for sharing. Love these 2 cards. The Second is absolutely WONDERFUL. To me it almost has an oriental feel to it. WHAT IS a SAMJ ? I am still learning about all the tools. Beautiful cards, Lisa! Love the overstamping and of course your design layouts are always so creative! Hugs! Love how you stamped the sentiment over the pale image on the second one. Beautiful effect! Beautiful cards...Love all your work, I can't wait to get some of the new sets...I love how your sentiment stands out wtg TFS!! Both are gorgeous! I love how you showcased the sentiment. Beautiful cards, both of them! Love the vintage feel on the 1st and you I'm such a huge fan of muted images and over-stamping the sentiments.....fantastic look!! HUGS!! Lisa, love these cards! The 2nd card speaks to me with all the cool details!! Awesome work!! Beautiful samples Lisa! Love them both but especially love the overstamping of the sentiment over the image! Beautiful layouts and designs! Two pretty clean and simple designs....well done!